Originally announced in March 1996, the first version was released in May 1996 bundled with the beta version of Internet Explorer 3.0. When ActiveMovie was installed an option was added to the Start Menu to launch the ActiveMovie Control. 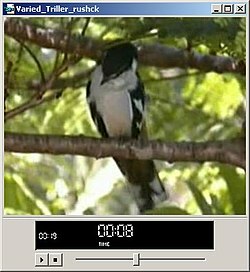 This allowed users to play multimedia files and thus was a rudimentary media player. In March 1997, Microsoft announced that ActiveMovie was going to become part of the DirectX set of technologies, and by July it was being referred to as DirectShow. ^ "Microsoft Announces ActiveMovie". News Center. Microsoft. 1996-03-05. Retrieved 2006-12-31. ^ "Microsoft Internet Explorer 3.0 Beta Now Available". News Center. Microsoft. 1996-05-29. Retrieved 2006-12-31. ^ "Microsoft Evolves DirectX Multimedia API Services". News Center. Microsoft. 1997-03-31. Retrieved 2006-12-31. ^ "Microsoft and Progressive Networks Collaborate on Streaming Media". News Center. Microsoft. 1997-07-21. Retrieved 2006-12-31. ^ "How to Add Start Menu Shortcut for ActiveMovie and Media Player". Support. Microsoft. 2007-01-23. Archived from the original on 8 August 2007. Retrieved 2007-06-28. This page was last edited on 12 December 2017, at 06:05 (UTC).